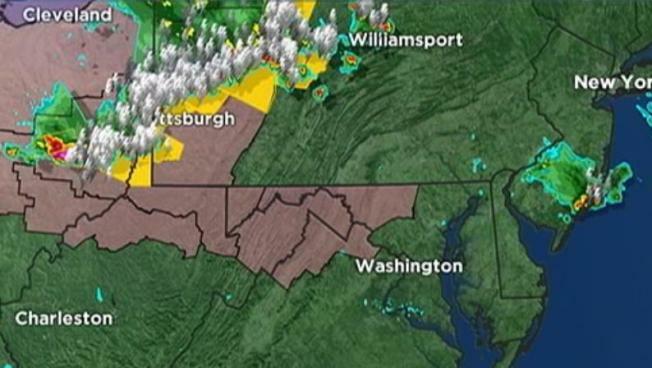 A line of storms moving from western Pennsylvania caused the entire D.C. Metro area to go under a Severe Thunderstorm Warning late Tuesday evening. A Severe Thunderstorm Watch remains in effect until 1 a.m. Wednesday for the entire region. Storm Team 4 Chief Meteorologist Doug Kammerer said the storms weakened once they reached the Metro area, but wind speeds of 65 mph were recorded in Maryland. Another line of storms will approach the area overnight but Kammerer said it will stay to our north, perhaps in upper Washington and Frederick counties in Maryland. Severe weather is expected in the area Wednesday and Thursday, paired with temperatures reaching into the mid-90s. Follow Doug Kammerer on Twitter.